If you are having gall bladder problems... and especially if you have had your gall bladder removed, you need to supplement bile acids to assist your body in the digestion and absorption of fats and fat soluble nutrients! 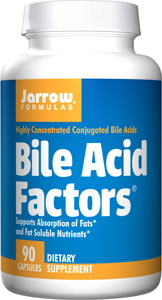 Bile Acid Factors consists of a mixture of highly concentrated bile acids (also called bile salts), mostly in the conjugated form. In the small intestine, bile acids emulsify fats to aid their absorption. Bile acid deficiency causes fat malabsorption and fatty stools (steatorrhea), indicated by diarrhea and floating stools. In addition, bile acid deficiency jeopardizes a person's nutritional status by reducing the absorption of fat and fat soluble nutrients. Take 1-3 Capsules with a meal containing fat, or as recommended by your qualified health care consultant.